I love saving money so much that I almost won't buy an item if it doesn't have a coupon. I just hate paying full price! Worrying about paper coupons can take up so much time and space in your life. But I'll bet you probably have your phone with you most of the time! Downloading a coupon app is the easiest way to save money without worrying about a paper trail. 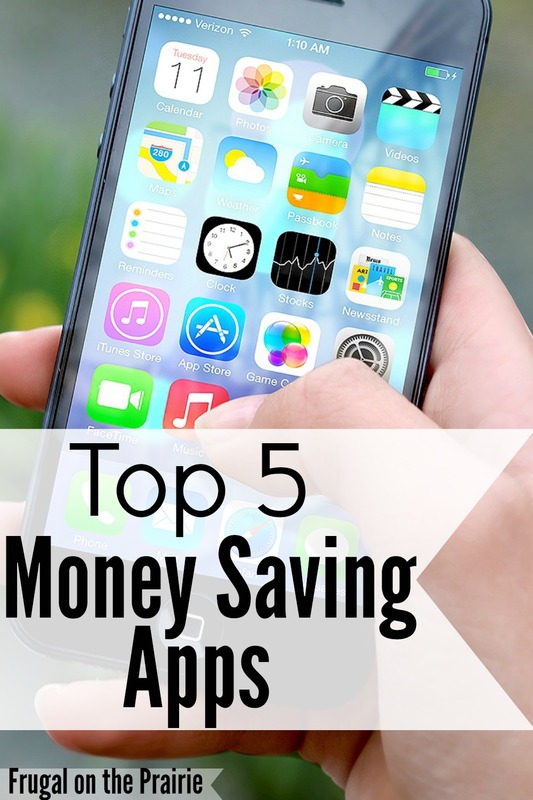 Check out my top 5 money saving apps for finding a discount or saving money. Hands down, this is the best coupon app I've ever used! I like to "Favorite" all of my frequently visited stores so they're the first thing I see when I open the app. This helps me avoid the juggling act of holding a baby and searching on my phone at the same time. They carry deals from over 50,000 retailers for both in-store and online purchases and also offer restaurant coupons. You can search by the nearest deal to your location, by a business name, or by a particular categories. This app is going to save you so much time! Find any item you like in a store, scan it in the app, and it will tell you if there's a lower price available somewhere else. We've all got better things to do than to run around looking for the cheapest price. Let this handy tool do the chasing for you. Wal-Mart is brilliant for creating this. Each receipt you get at a checkout contains a barcode that you can scan into the app. It will then go over every item you purchased, and if someone else has a lower price advertised that day, Wal-Mart will refund you the difference. I received $3.00 back the very first time I used it. I shop at Wal-Mart before I go anywhere else every single time now! You know when you go into Target for 2 items and come out with 14? This might help you save a little money so you don't have to feel too guilty. I especially love the great Women's Apparel discounts they offer. Searching for a coupon for a specific item can be really time consuming. But Cartwheel has a feature that lets you scan the item to find out if there's a discount available. Then, you can add all of the coupons you want to use to your own personalized barcode and the cashier only has to scan it once. Talk about an easy-to-use time saver! I've scored some ah-mazing deals on Zulily! You can see what sales are coming up and also set a reminder to check them out when they go live. They post a new deal every morning at 6:00 PST sharp. Zulily's children's section in particular is always out of this world. There's so much Christmas or birthday gift potential! My kid could have a room full of clothing and toys just off of this app alone. I have never been a paper coupon user because I just don't have the time or the energy to cut them out and then carry them around. But using a coupon app takes all of the hassle out of saving money. I wish there was some way I could add up all of the discounts I have received over the years because it would be a large figure! What money saving apps do you use? What are your favorites?